Marks & Spencer and John Lewis. Wilmslow residents have easy access to good supermarkets, there are two in Wilmslow town centre, Waitrose Store and Sainsburys. There is also a Tesco Express which includes Wilmslow's Main Post Office. Alderley Edge has one supermarket, Somerfield. A further two supermarkets, Tesco Store and Sainsburys, can be found just off the A34 road, known locally as the Wilmslow By Pass. These are approximately 10 and 15 mins north of Wilmslow town centre. There is a wealth of speciality shops catering for a wide range of needs. Some of these are listed below, and others you will discover when visiting Wilmslow. We hope that the information on this site is correct. However, we cannot accept liability for any inaccuracies - please let us know if you discover any! This store has a very wide range of high quality goods, for example, they sell a variety of white goods, paints and wallpaper, garden furniture and equipment, curtain and dressmaking material as well as fashion and household goods. There is a restaurant upstairs and a cafe downstairs. The store is beside Sainsburys supermarket. There is a big car park next to the store which is free . There is a bus service to the store from Wilmslow ( Bank Square ). The journey takes about 30 mins. is well known for the quality of its ready prepared foods. There is a very big car park next to the store which offers free parking. The store is next to Tesco , a large supermarket. and Allders which sells household goods. There is a free bus service from Wilmslow to Handforth Dean every Mon. and Thurs. It starts at Knutsford Road, Fulshaw Park and picks up at a number of places including Arlington Way, Moor Lane ( Riflemans Arms ), Bank Square, Lacey Green and The Paddock in Handforth. Britain's love affair with Aga has spanned decades: the Aga shop provides enthusiasts with the ideal retail experience. Boasting a wide range of Aga cookers with a choice of 15 colours - there really is an Aga to suit every style of kitchen. Taste the difference and experience a cookery demonstration in store, please ask for our Events Programme or you can arrange for an Aga Test Drive, just speak to one of our members of staff. Cookware is essential and the Aga Cook Shop Collection contains stylish, functional products that prove a useful addition to any kitchen. Visit the Aga Shop in Wilmslow or call to request more information. House Proud is a family company which offers a friendly and personal service to provide the finishing touches to your home - all those accessories that are so difficult to find and yet make all the difference. The range includes door and window fittings, electrical fittings, bathroom accessories and many other items. The products are of high quality and in both traditional and modern styles, many of which are of British design. Lakeland Limited, founded in 1963, is a family business based in Windermere, with over 30 stores nationwide, including Handforth. They are the UK's leading kitchenware specialist, offering a range of around 3,000 products, from innovative kitchen utensils and clever storage solutions to specialist preserving equipment and delicious speciality food. Lakeland's products are also available online or by mail order. Wilmslow Interiors has been established for over 20 years and offers a comprehensive, personal and professional service. The range of products includes carpets, curtains and wallpaper, and samples of all are available in the shop. Each product is selected for its quality, design and value for money. Carpets and curtains are installed and fitted to a very high standard by highly skilled craftspeople. All enquiries are welcome and advice given if required, including a free home consultation and/or quotation if appropriate. 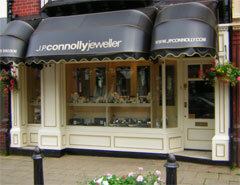 We retail with passion and enthusiasm the finest jewellery and wristwatches from our showroom in Wilmslow. Family owned and managed since 1910, Cottrills is particularly renowned for handmade diamond jewellery, extensive swiss watch brand collections and our wedding ring studio. Our workshop creates jewellery of the highest quality and today we are unusual amongst retailers in that we employ our own Goldsmiths and setters rather tahn sub-contracting out or using out workers. Expertise and a desire for excellence inspired the creation of Harrington and Hallworth some 25 years ago. The secret of their success comes from knowledge, an insistence on the very best and the utmost care of their clients. The showroom is able to offer many of the most famous brands available in the world today. Exclusive collections from Chopard, Cartier, Bulgari, Omega, Gucci, Jaeger-le-Coultre and others grace the luxurious showroom on Wilmslow's Grove St.
Clients visiting the showroom expect exclusivity and individuality in their choice of jewellery. Clients with their own design ideas can expect complete satisfaction in the company's ability to interpret their wishes. For those who want individuality but don't have specific ideas in mind there are a wide range of handmade individual pieces in the showroom. 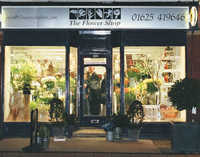 Haslams of Wilmslow is a family run business that has been trading for over 30 years. We are Footwear Specialists that offer high Quality footwear with an excellent standard of service & fitting. Highly qualified shoe fitters, all members of the Society of Shoe Fitters, will offer you personal service in a friendly environment. Gabor, Van Dal, Peter Kaiser, Rohde, Ecco, Dexter, Crockett & Jones, Barker, Mephisto, Grenson & many more top brands instock. A fine selection of platinum, gold, gemset, modern and antique jewellery. Antique silverware and flatware. rare pieces of Royal Copenhagen porcelain. Jewellery, clock and watch repairs. 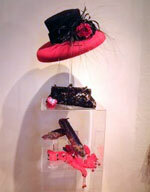 Eclectic boutique with fabulous hats, fascinators and accessories offering a bespoke hat service with hats designed by Susy Krakowski as well as a selection of Marzi and Grevi hats. A large range of jewellery including Danish and Italian designs. Stunning clothes, handbags by Orca, wraps, gifts and much more plus sale starting in January. Peter Herd is an established Bakers and Confectioners and household name in the area since 1972. We produce real bread made by real craftsmen, made to measure sandwiches including the popular all day breakfast, freshly baked hot savouries and a mouth watering selection of cakes. We offer a Total Corporate Package including all day breakfasts, working lunches, buffets and corporate cakes. Our wedding and celebration cake department offers a range of tailor made services to suit your individual needs. Our highly skilled team are willing, able and delighted to deal with any query by telephone or appointment to discuss all your requirements. This store doesn't carry a large range of goods but it's prices are very reasonable. This store is next to John Lewis Department store, about 15 mins. by car from the centre of Wilmslow. There is a bus service to the store from Wilmslow. Buses leave from Bank Square in Wilmslow at 9.15, 9.45, 10.15, 10.45 continuing this pattern up to and including 1.45pm. There is a car park next to this store. It is owned by the local council which charges for this amenity. There is parking in front of the store for which there is a charge. There is a pharmacy in this store. It dispenses private prscriptions, but does not dispense NHS prescriptions. However the pharmacist is happy to give advice. 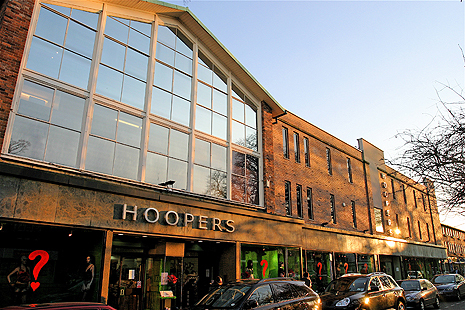 The store is located between Marks & Spencer's and Allders, about 10 mins. by car from the centre of Wilmslow. There is a very large car park in front of these stores where free parking is available. There is a free bus service from Wilmslow to Handforth Dean every Monday and Thursday. A Wilmslow business, the largest online UK retailer of quality chocolates !